July 23, 2009 - More than 50 U.S. organizations today urged the U.S. government to "strictly prohibit any U.S. cooperation with or assistance to the Indonesian Special Forces (Kopassus)' in a letter sent today to President Obama, Secretary of State Hillary Clinton and members of Congress. 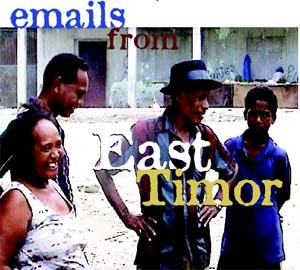 The letter was coordinated by the East Timor and Indonesia Action Network (ETAN). "Restrictions on U.S. military assistance to Indonesia are needed to support democracy and human rights in Indonesia. 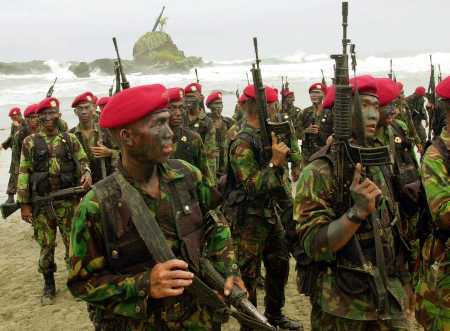 Supporting Kopassus, which has a long history of terrorizing civilians, would send the worst possible signal to those fighting for justice and accountability in Indonesia and East Timor," said John M. Miller, National Coordinator of ETAN. The letter, signed by human rights, religious, peace and other groups, states, "The history of Kopassus human rights violations, its criminality and its unaccountability before Indonesian courts extends back decades and includes human rights and other crimes in East Timor, Aceh, West Papua and elsewhere." A recent Human Rights Watch report documents how Kopassus soldiers "arrest Papuans without legal authority, and beat and mistreat those they take back to their barracks." 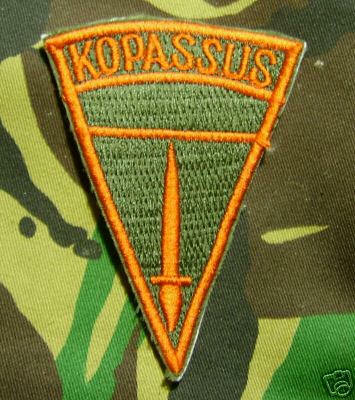 In 2008, the Bush administration proposed to restart U.S. training of Kopassus. the State Department legal counsel reportedly ruled that the ban on training of military units with a history of involvement in human rights violations, known as the Leahy law, applies to Kopassus as a whole. "The previous administration was forced to conclude that training Kopassus was both illegal and bad policy. The Obama administration should maintain this restriction," said Miller. We the undersigned organizations call upon the U.S. government to strictly prohibit any U.S. cooperation with or assistance to the Indonesian Special Forces (Kopassus). This force, more than any other in the Indonesian military, stands accused by the Indonesian people of some of the most egregious human rights violations. The annual human rights report of the U.S. Department of State, the East Timor's (Timor-Leste) truth commission (CAVR), United Nations human rights monitors, and the full range of Indonesian and international human rights have reported in detail the many crimes of Kopassus. Those responsible for these violations continue to enjoy broad impunity for their actions, even in a democratizing Indonesia. The history of Kopassus human rights violations, its criminality and its unaccountability before Indonesian courts extends back decades and includes human rights and other crimes in East Timor, Aceh, West Papua and elsewhere. In 1998, a program -- organized and led by then Kopassus commander (and recent vice- presidential candidate) General Prabowo Subianto -- kidnapped, tortured and killed pro-democracy activists. Prabowo told reporters he is unrepentant over these crimes saying, "we could say it was preventative detention." Other well-documented Kopassus crimes include organizing anti-Chinese rioting in Jakarta in 1998 and the 1984 massacre at Tanjung Priok in Java. Throughout 24 years of brutal Indonesian occupation of East Timor, Kopassus personnel, tortured and killed civilians in an attempt to intimidate and terrorize the population. Kopassus personnel played a key role, including organizing militia proxies, in the violence and destruction during 1999, the occupation's final year. The crimes of Kopassus are not only in the past. A recently published Human Rights Watch report details ongoing Kopassus human right violations in West Papua. The report documents how Kopassus soldiers "arrest Papuans without legal authority, and beat and mistreat those they take back to their barracks." Those who favor engagement argue that U.S. training could lead to reform of Kopassus. This argument is clearly refuted by history. For decades, the U.S. trained and gave other assistance to Kopassus personnel, including General Prabowo and other leading officers. This relationship had no ameliorative affect, rather, it provided the equipment and skills used for repression. U.S. law prohibits the training of military units with a history of involvement in human rights violations. This provision has been long been interpreted as narrowly as possible. However, in 2008, the State Department ruled that the ban, known as the Leahy law, applies to Kopassus as a whole. We believe that this ruling should apply and the U.S. must continue to refuse to train Kopassus. Mary T. Whittlinger, Treasurer GOMA ( Ecumenical Moluccan Church). Roger S. Clark Board of Trustees International League for Human Rights. Concerns over Indonesian military abuses in Papua are at the heart of a letter to the US President from more than 50 organisations urging Washington to cut ties with the Indonesian Special Forces, or Kopassus. The letter, signed by human rights, religious, peace and other NGOs, calls on President Barack Obama to prohibit any cooperation with or assistance to Kopassus. The Papua region is recognised as the last region in the country where Indonesia's military can still operate beyond civilian control. One of the letter's signatories is the West Papua Advocacy Team whose Ed McWilliams says Kopassus factions are suspected of being involved in this month's wave of deadly attacks on Freeport mine employees in Timika. "Some are loyal to their former commander Prabowo (General Prabowo Subianto) and some are not. So it's a very complex situation on the ground in the Timika/Tembagapura area and as a consequence we?re hoping that we can get an investigation that will be transparent and something we can respect in terms of outcome."